Do you live in a Tropical Rain Forest? I am a big believer in the merits of straw bale construction. That’s probably obvious by now; however, there is one major drawback to working with bales: climate conditions. Bale homes are ideal for dry and mostly dry climates, acceptable in wet climates, and difficult to deal with in very wet and humid climates. So what about tropical climates and straw bale construction? The big demon is not water, in the form of rain at least. In stead, it is humidity. Rain can be handled with proper design so even the wettest climates can accommodate straw bale structures. Humidity, on the other hand, cannot easily be designed out of a structure. It pervades everything and gets into everything. A bale house can stay dry from rain and still be saturated with moisture inside the plaster due to the acclimation of the bales to the area’s relative humidity. Everything eventually settles on a moisture content that is in direct relation to the relative humidity of its surroundings. Therefore, if the humidity is high, so too is the moisture content of your bread, your clothes, and your bales! Let me give you an example, I used to live in Northern California, where humidity was often very high due to the coastal fog. My wife put her leather boots under our bed for a month and when she took them out, they were covered in green mold! Our house seemed fine and we surely did not expect to see that kind of mold anywhere near the inside of our house. But, the space under the bed is dark and has limited air movement, kind of like the space in between your layers of plaster. What to do? 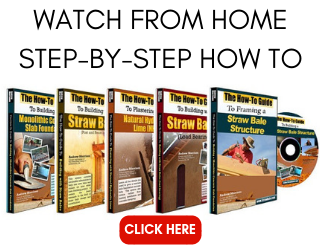 Well, you must first consider if your climate is right for straw bale construction. If you have really high humidity and very little dry season each year, you may want to consider something other than bale construction. Another option is to consider mechanical help. If you install a whole house de-humidifier, you can minimize the amount of moisture in your house and therefore in your bales. Remember that when pressurized under normal living conditions, air moves out through the walls. If the air is dry, it is safe to pass through the walls. Systems like this can be installed into your HVAC system, if you have one, or can be stand alone units utilizing 4″ duct work. Remember to design and build for the water and humidity. You not only need to design to keep water out, but also to allow it to escape should it get in (nature has a way of blowing even the greatest plans!) Plan for both, and you will be okay. Nevertheless, if you live some where that you think is too risky, ask for advice and then make whatever decision you feel is best around the use of bales in your home. And know that this is coming from some one who loves bale construction so I’m trying to talk you out of your dream! I am really excited about the idea of building some Straw Bale houses in Southern Brazil. But, The winters can be quite humid. The summers are hot though, and it seems that it is not overly humid. What relative humidity is acceptable in the damp winter, 80%? And for how long? Andrew….I’ve heard of a straw bale house in greater Houston that used some special plaster that was extremely good at keeping humidity out (Houston gets humid). Can you comment on this? It sounds like you believe no high tech plaster will keep humidity out? I’d love to hear more about this Chris. I’ve heard of silicate paints and their properties of moisture control. I wonder if this is what they used. Please tell me more. Planning a building project this summer and still weighing straw bale vs. earthbag building. My main concern is moisture. I live in Virginia, near the W.V., N.C., an TN borders and wondering how you think straw would hold up in this area? I really like the strength and insulation properties of straw, but not if I end up with rotted and/or moldy walls. Do your videos cover methods for helping with this at all? Hi Brandon. My DVDs don’t specifically speak to high humidity areas in any in depth fashion. e have built homes in Tennessee with great success and I know there are others in the Southeast that are doing fine. You will have to take into consideration the high humidity and make some design decisions based on that, but I expect that with the right planning and implementation, you wil be fine. Tropical climates are harder for straw bale but not necessarily impossible. You would need to provide mechanical ventilation and dehumidifying, which may be more complicated than the build would justify. Those systems, here in the States, are not expensive and are easy to install; however, I don’t know how available they are in India. If available, then a good option for sure. Roofs can be whatever you want. I would want something with a large overhang, but other than that, you can choose what works best for you. I have a question. I want to do a strawbale house where I live in istanbul. going through a mild climate and the winters are rainy and snowy. concern is being able to make a good roof insulation. I have an idea you would like. Sounds like a good location. Rain and snow are no problem as long as you have a good roof and foundation. 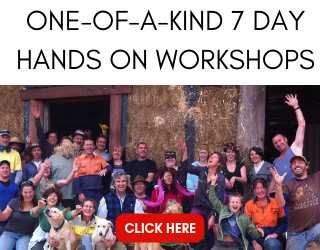 Hi Andrew, I seem not to be able to find the ‘one and only’ answer for Earthbag vs StrawBale. Darn. I live in hawaii where humidity is pretty much always at least 60%, is this climate too humid for a straw bale house? I really would love to be able to build and live in a relatively small and efficient home that wouldn’t cost too much if I built it myself. That would likely be too humid. That said, Hawaii is a climate where I don’t know that straw bale would be worth the effort anyway. It is better suited for really hot or really cold climates where outdoor living isn’t acceptable. I would think something with more outdoor space (covered and finished, would be desirable. Of course, I’ve only been to Hawaii once and I realize there are many different climates there. I am thinking about a StrawBail house to be built on a coral island in Kenya, its piping hot all year round, with 330 days of sunlight. But humidity is 75% nearly always. Am I going to have to scrap all of my plans?! That’s a tough one. Humidity can be hard for bale houses to handle. That said, there are successful bale homes in Georgia, Tennessee, and the Pacific Northwest, so you may be okay. Do you know how your climate compares to those? Andrew, great to see all these responses. The site I plan to build in the state of Punjab, India (non coastal area) has around four months of very high humidity in the monsoon season. Annual average relative humidity is around 52. Monthly averages are given below. a) As it is, would you completely rule out straw bale for this climate? b) Is humidity more of a problem for interior or exterior layer? By your description, it seems interior is a bigger problem. I take your suggestion for large overhangs for protecting exterior from rain. c) If it’s the former, can design features such as a solar chimney for ventilation or rooftop wind-powered attic ventilators and/or use of charcoal for dehumidification indoor air take care of it? It will be at a farm so charcoal even in large quantities should not be a problem, besides it can be re-used after drying. I am not clear on what the relationship is between relative humidity and wall moisture content. I know there is a correlation; however, it is not as direct in terms of numbers as you might think. With that “disclaimer” in front of us, my answers are below. a) I don’t typically rule out straw bale in any climate that easily. Although humidity can be a major issue, it can be handled in many situations. There are successful straw bale homes in Tennessee, Georgia, Florida, and other high humidity areas. b) The humidity becomes an issue when it saturates the interior of the bales themselves. The bales can dry out very well when the surfaces get damp by releasing the moisture into the air (once the humidity of the air drops enough to accept the excess moisture). Moisture trapped in the center of a bale is much harder to remove. In high humidity areas, I suggest thicker plaster (either earthen or lime on the interior and lime on the exterior) and interior climate control. c) Any interior climate control steps will help. I often suggest energy recover ventilators because they offer fresh air exchange and dehudification without a lot of energy loss. Charcoal could also work although I am not familiar with how it would be installed to be most effective. You may want to start with a small structure first and get a sense of how well it works before you commit to a full scale project. If you don’t have time for that, then be sure to do some small tests. I would suggest placing a bale out on top of some wood stickers and then plaster it. Cover it with a make shift roof and let it sit for a while . You can then check the condition of the straw with a moisture meter from time to time and then tear the whole assembly open after a year or so. Anything you can do will help discover the impact of the humidity. Finally, there may be some studies out there that draw a straight line between relative humidity and wall moisture levels. If you can find that, you want to make sure that your yearly average doesn’t go above 20%. Monthly readings could elevate above that as long as your lower numbers are around 8-10% so that the bales can dry during those months. Yes, very helpful. Test installation is a good idea and so is energy recovery ventilation. Thanks. Very timely discussion, Andrew. Thanks. I’m planning to build in Florida, and was prepared to challenge the conventional wisdom of not doing straw bale in this climate (but still torn). I’m very confused about the way to go with plastering. I thought you said in another thread that earth on the interior and lime exterior fails over time, but you’ve recommended it here (applied ‘thicker’)? Is the lime just problematic if used over earth/clay? Hi Ian. Sorry for the confusion. Yes, earthen plaster UNDERNEATH lime plaster is what is bound to fail. Earthen on the interior, applied about 1/2″ thicker that the exterior lime plaster is a fine way to proceed. The only contact information I can find for Florida bale homes is on Greenbuilder.com. I know there are some others that I have heard about over the years, but I don’t have contact information for those people. Sorry. I am an engineering student from Kuwait who is asked to change the exterior walls/roofs, add insulation, modify the HVAC system according to my choice of wall material. My choice of material and my design must result in a drop down of electricity consumption by 50%. Thanks to you, now I want nothing but Straw Bale as the villa’s exterior walls. Now as you may know, Kuwait is an extreme hot and dry country. However, in summer, August and July may have high humidity days. Now my question to you is, while aiming for straw bale as my wall material, do I consider it impossible to be perfect as an insulator because it might not function well in these two months? or can it bear these two months with some proper plastering? help! I need your inspiration. Hello Mona. I think your walls will perform really well. Because the rest of the year is very dry, the bales will have a chance to dry out well. The two months of humidity should be acceptable for the bales. You might consider adding a heat recovery ventilator system to the home to help in those humid months to remove excess humidity. I will be attending your workshop in Montana this coming fall. My eventual intention is to build a SB home on our lake property in northern British Colombia, about six hours driving from the most southern part of the Alaska Panhandle. It is absolutely gorgeous there, right in the the heart of the coastal mountains, with snow capped mountains all year round and Douglas Fir and Cedar trees that are 5 and six feet in diameter. It is a high humidity area and that is why the vegetation is so lush. I will certainly do the experiment you mentioned above and plaster a strawbale with a make shift roof and observe it for a year. I am confident that a SB home could be built there in the summer when it is reasonably hot and dry without the bales getting wet. In winter, however, the air is always dry in a home because you are heating up cold air that can’t hold that much humidity anyway and it regularly gets down to -5 Fahrenheit. I am wondering, is it not a good idea to have a vapour barrier on the OUTSIDE side of the Strawbale only and let the air breathe only on the inside wall? I have also wondered about sprinkling copious amounts of “baby power” or some other moisture absorbing powder that itself will not rot on the bales. That would absorb some of the moisture out of the bales and in the summer when it is hot again, it would dry out again. Hi Jason. This is an interesting question. I have to be honest that I am not an expert in cold climate condensation mediation. That said, the vapor barrier installation seems like a bad idea to me. The bale houses I have worked on in cold climates (northern Canada) have not had any vapor barrier and they are performing really well. As long as the climate provides adequate access to dry air during the year cycle, the home should be fine. Also, you will want to seal all air infiltration points on the interior as that is where the majority of your moisture will come from. This is wall to floor/ceiling junctions, wall penetrations (electrical boxes, etc. ), and partition wall intersections for example. I don’t know the properties of baby powder, but as long as it will release moisture and not just absorb it, that would be fine. It would smell good too! Andrew, what are the approximate relative humidity levels that can be a safe bet for strawbale buildings, without having to worry much about having dehumidifiers. Also, is it easy to go for a straw bale building in climates where 3-4 months are highly humid and other months having lower humidity levels? I must admit that I am not great at identifying humidity levels for bale houses by number. I can say that I have built bale homes with success in Tennessee, Georgia, West Virginia, and Arkansas, as well as places like Washington, Oregon, and British Columbia. All very humid places at certain times of the year. As long as they have a chance to dry out during parts of the year (the majority of the year being drier is best), you will be fine. Thinking about building with straw bale in Holland. Average humidity 80-85% in winter, 70% in summer. Hi Mel. I am not familiar with the climate in Holland so it is hard for me to say. It sounds pretty wet based on your numbers; however, there are bale homes in areas like Tennessee, Georgia, and the Pacific Northwest of the United States as well as places like Ireland and Great Britain, and they are doing just fine. Most of those homes include a mechanical system like an Energy Recovery Ventilation System (ERV) to help with the removal of excess moisture. I’m sorry I don’t have a better answer for you. Hi Andrew, I am a die hard fan of this n wana built one somehow. But I’m from kerala(India) where the humidity is too high for it. I really don’t want to spoil the virginity of the method but, seriously, have you thought of giving the bales some kind of sophistication to resist water. That is, transforming pure strawbales to a water resistant composite material, yet retaining its naturality? I know of some people who are considering using bales of recycled plastic bottles as their bales for just this reason. I do not have any data testing or other information other than knowing that it is something that may be tried soon. I can see how that could be beneficial to people in high humidity areas, for sure. hello, I am a civil engineering student in the phillipines and we are conducting a study on rice strawbale construction and we are encountering such problems because of the humid weather. Could you please share some idea on how we can solve this problems. thank you..
… we live in Denmark and have a wonderful strawhouse – no smells inside the house- no mold at the walls … but now during summer I feel it is very humid when I come home at the sun has been on – it might be drying from Winter ?.We only live there during summer time and there is no heating during Winter – could that be the reason ? I find all my clothing are smelling a Little wired – not like humid smells from normal houses with fungi and molds .. or molds but hay like – and it cant go off in washing also new washed clothing – it feel a Little humid I think ?? – – is it dangerous ? or is it just like that living in a straw ball house ? Would it help to heat up the house during Winter once and a while ? I have not heard of that experience before. My guess, and it’s only a guess as I have not seen the house in person, is that it has to do with the home being closed up and not heated during the winter. If possible, I would suggest you find a way to keep at least a low level of heat on through the winter to help keep things conditioned and dry. I am exploring the mud straw construction world and feel drawn to build a simple one room 16 by 16 in Vermont. I have not seen any similar structures in the Northeast. There is a big problem with moisture and frost. Cold in the winter with frost to 4 feet and mold/dampness in the summer. The weather here is often cloudy and dry season rare. I do not think straw- mud is an option? Hi Richard. There are a lot os straw bale structures in Vermont, Maine, Massachusetts, New York, and the great New England area. The climate is fine for bale structures. I don’t personally think clay is a good option for plaster and would recommend natural hydraulic lime instead. It’s more durable and protects against the elements far better than clay plasters. I m working on a community center . My site comes under hot and humid climate(India) . Could u suggest me some material to be used with straw bale to strengthen the building against humidity. Hello Mahak. The best option for high humidity areas is earthen plaster. That said, an exterior earthen plaster can require a lot of annual maintenance, something most of us are not excited about. The second best option would be a lime plaster exterior which helps with humidity and also resists wear and tear very well. You could do the interior walls with earthen plaster to help with mitigating interior moisture levels. Just be sure to make the interior earthen plaster THICKER than the exterior lime plaster. For a 1.25″ exterior, I recommend a 2″ interior. This will slow down any moisture movement into the walls and provide for years of durable, healthy bale walls. Cheers. 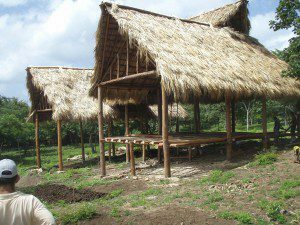 it is possible to build the straw bale house in Philippines? 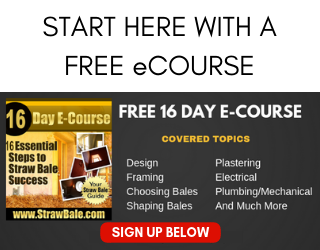 what should be the considerations in building straw bales in terms of climate? It’s possible for sure. The biggest issue is the humidity as that’s hard to eliminate from a bale house. You can use mechanical options like dehumidifiers and HRVs or ERVs if the levels are “too high”. There are a lot to consider, so that’s a hard question to answer quickly and easily. I would say that the biggest issue is humidity. Rain, snow, wind, etc. can all be designed out, but humidity is hard to manage. It typically requires a combination of approaches, including mechanical systems and natural plasters. Good on you for answering all the questions this post has elicited. They are helpful for other readers as well as speaking to your patience and generosity. I am in Bali and embarking on a rice bale in fill walls with about four layers of lime-crete. The idea is we take the rice straw, leave it out to flat to dry as much as possible. When ready bale, stack, pack tighten and spray the first coat within a day. This is to ensure no insects and dryness. The idea also is while the straw is drying we sprinkle hydrated lime over it and possibly slightly viscous hydrated lime (not sure yet), with the thinking will help with bonding, reduce humidity as the lime with pull out the moisture from the pockets of air, plus it will make a less friendly place for a insect to call home. I would love your feedback on my plan. Do you think it will work? Hi Edward. Thanks for your message. I see two potential issues with your approach. First, when you rake and bale straw, it tends to be at a slightly higher moisture content so that the straw bends and doesn’t break in the baling process. This actually makes the bales stronger in the end. The issue is that the excess moisture typically dries out over the next few days (assuming the climate allows for it), but you wouldn’t have that drying time frame available. Part of the issue is also that the bales tend to shrink just a touch in that drying process. If you stack all of the bales tightly into the wall and THEN they dry a bit, your walls will be slightly looser than they were when you staked the bales. This can be fine if you plan for it, but can have a negative impact on the overall strength and tightness of your wall if you’re not careful.